Six empty glasses sat in front of Erin Price as she swirled a lightly-oaked chardonnay at The Wine Country Inn on Thursday. “Many of our younger guests will appreciate the wine selection,” she told her mother, Linda Price, as she dutifully sipped the possibilities that could be served at her upcoming wedding. Erin and Linda, both from Virginia, were in Palisade for a three-day whirlwind wedding planning trip. “I think I’ll just take them all,” Erin said with a light-hearted laugh. Erin, 30, is the recipient of 2013 The Wedding Pink, an annual wedding giveaway created by 21-year breast cancer survivor and professional photographer Cheryl Ungar of Denver. Each year, Ungar’s nonprofit organization chooses a young breast cancer survivor to receive a destination wedding in Colorado. Erin was 27 when she was diagnosed with breast cancer. She lost her hair while receiving neoadjuvant chemotherapy, and she battled depression. Her cancer treatment was followed by a mastectomy with implant reconstruction. 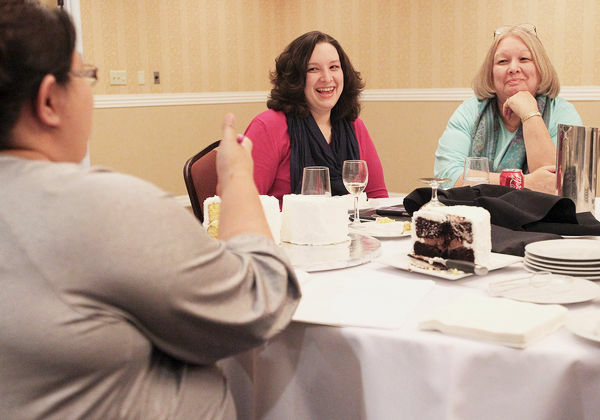 “My two-year ‘cancer-versary’ is on St. Patrick’s Day this year, and it’s also the day of my wedding shower,” Erin said as she and an entourage of wedding coordinators moved from the Tapestry Lounge to the Vineyard Ballroom to discuss décor. “I like soft-romantic, vintage and rustic,” she told Sheryl and Rachel Fisher, the mother and daughter-in-law owners of Shimmer, a Grand Junction event design and coordination company. Using her iPad, Erin showed the Fishers pictures of her favorite shabby chic wedding ideas that she had saved on Pinterest. April Nichols, director of sales at Wine Country Inn, spread an ivory lace overlay on the table. “Like this?” she asked. “I love that,” said Linda, as she watched her daughter plan her dream wedding. She added that having a celebration to this scale would not have been possible without Ungar’s help. Between 75 and 100 guests, most from the East Coast, will attend the wedding in Palisade in May. “Getting married in a place like this is always going to have significance for them,” Linda said of the bride and groom, noting that she finds the beauty of Colorado, especially Glenwood Canyon, startling. Erin and her fiancé, Ben Schabert, will be married by officiant TJ Dickerson in the outdoor gazebo area at the inn. The wedding party will wear pale gray, but hints of pink will be found throughout the décor. Dinner will be a choice of steak, salmon or butternut squash gnocchi prepared by the inn’s Le Cordon Bleu trained chefs. At the cake testing, Erin and Linda selected devil’s food chocolate and lemon cakes donated by Sweet Treats by Danielle. There also will be a cookie and candy bar. Most of the wedding, estimated at $30,000, has been donated to the couple by local businesses such as the CandyTime Shoppe, DJ Ryan Griz Entertainment, JR’s Carriage Service, and 3 Leaf Floral Design. “I’m all for simple and pretty. I just want it to look good,” Erin said. “We’ll make all that happen,” Nichols assured her. Photo by Dean Humphrey. Erin Price, center, and her mom Linda listen to a presentation by Danielle Versluis of Sweat Treats by Danielle about wedding cake.